Anyone who has heard of or played a Souls-related game knows that the word challenging gravitates to the forefront. 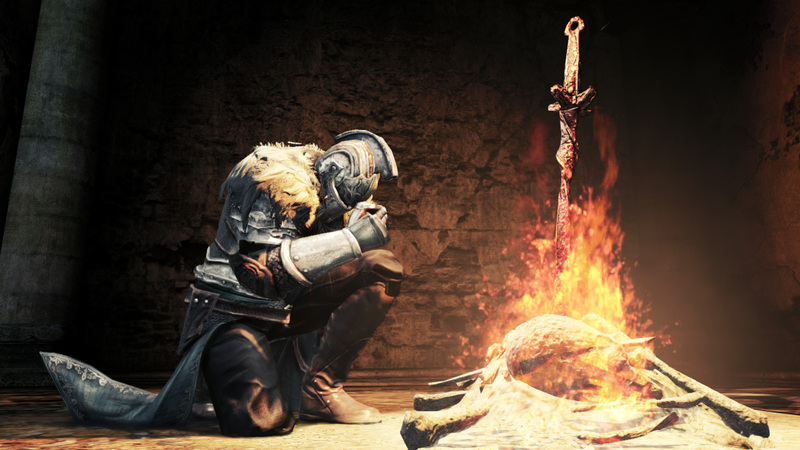 With intimidating enemies, a combat system unlike almost any other and an open world that rarely points you in the right direction, The Souls franchise has a reputation that can be summed up simply as unforgiving. I am not and will not pretend to be a Dark Souls veteran. In fact, after hitting a wall with my third character in the original Dark Souls (due to a combination of the Capra Demon boss and foolishly killing a merchant that sold helpful items), I threw in the towel. Maybe a little over a month ago I purchased its sequel Dark Souls 2: Scholar of the First Sin in an attempt to test myself on next-gen.
From the get-go it was a disaster. After proceeding through the initial tutorial area into the main hub of Majula where the player can level up, upgrade armor, purchase items, etc., I made my first journey twice as challenging without even realizing it. While running around the town talking to everyone and searching high and low for items, I came across a rock that asked if I wanted to join a covenant. I agreed, seeing as a forlorn knight I had previously spoken to gave me a ring in exchange for joining his covenant that if worn would call other players also wearing said ring to my aid if my world were invaded by hostile players. The plot twist with the second covenant was that it increases the overall difficulty of the game. Enemies do more damage, have higher damage resistances and health and even notice you at a much longer range. It even disables the player’s ability to summon NPCs (computer controlled characters) to assist with certain boss fights. I finally noticed the error of my ways about 14 hours in at the beginning of the second area when I just couldn’t make any progress. However, if I paid any attention to the dialogue with a cat in one of the houses in Majula, she clearly warns of the impending difficulty if the covenant is joined. On top of that, she offers the option to get you out of the current covenant you are in. This is where the unforgiving nature of the game hits hardest. Whenever you die you lose a portion of your overall health. Although there are items that alleviate this side effect like rings and consumables, there are a limited amount of them throughout the game. Needless to say, I chose to start a clean slate. I’ve amassed around 50 in-game hours across three characters including a sword-and-shield user, sorcerer and evasive dual sword wielder. It’s not that I’ve tried and failed this many times because each play through (aside from the first) is still manageable. This is just one of those games that gets easier the more you fail, which is obviously easier to talk about than experience. But nevertheless, you begin to gain the ability to bait enemies into familiar attack patterns to take advantage of their weak spots, traps that surprised and killed you instantly are now easily foreseen and trial and error becomes second nature. Personal preference is starting to seem like the key to success. Figuring out your preferred fighting style is essentially the life blood, making the game strides easier when you come to areas you’ve never found yourself in, or ones that are “killboxes” with a high volume of difficult enemies. I’m still only at about the halfway mark despite starting over a handful of times, but the infinite save slots is a nice luxury for multiple characters and attempts. Iron Keep is the current realm I’m tackling, ready to face off against the Old Iron King. I needed to take a much needed break after finally making it to his fight at 3 a.m. and getting taken out with a single slap. Sometimes walking away and coming back with a fresh, more sane mind is the answer.